Some events, scenes and moments make stop,may be step back and look again; be it in life or in movies. Here’s one from a movie I watched recently- Shyamaprasad’s ‘Rithu’ (Malayalam,2009). It’s the story of three friends trying to accommodate their old friendship in their new found life. One of them tries hard to hold on to their relationship of the past, which the other two had moved on from. He feels cheated and left alone. The protagonist Sharat, goes to the lake, where the three friends spent time in their childhood. Depressed by the betrayals, he lays under an old barren tree by the lake. An old boatman draws his boat to the bank and recognizes Sharat. He inquires about the other two friends. 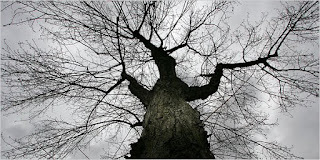 On getting a sad stare from Sharat, the old man continues,” Look at this tree .It is not from this place. It came to this bank during the floods many years ago and may be it is from a far away land where it snowed. Where does it snow in our land? Every year before the winter, the poor thing sheds its leaves, remembering its days in the other land."